Latest Posh signing Craig Mackail-Smith (centre) and current manager Grant McCann (left) celebrate victory in the 2011 League One play-off final. Craig Mackail-Smith is back at Peterborough United and he has unfinished business with the club. 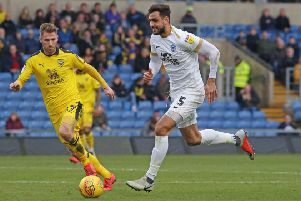 The 32 year-old star striker from three Posh promotions under top boss Darren Ferguson was a surprise loan signing by Posh today (January 31). Mackail-Smith has left League Two promotion contenders Luton Town in favour of helping Posh in their League One promotion push. Craig Mackail-Smith in action for Posh against Preston. The loan runs until the end of the season and Mackail-Smith is so confident his injury problems are behind him, he won’t take a wage if he misses training or matches for fitness reasons. First order of business for Mackail-Smith is to mark his third spell at the club with his 100th Posh goal. He insists he’s ready to start Saturday’s (February 4) League One fixture against Port Vale at Vale Park. “It’s fantastic to be back,” Mackail-Smith enthused. “It’s great that the gaffer (Grant McCann) has given me the chance to play regular football again. “The club have taken a bit of a risk on me so if I do miss matches because of injury I will give them my wages back. I want to repay the faith the club have shown in me and this seems a good way to do it. Craig Mackail-Smith in action for Luton against Hartlepool. “It shouldn’t come to that because I feel fit. I’ve trained consistently for the last six-to-eight weeks so it’s just matches I need. I have no issues with Luton because they are a good side in good form so it’s been hard to break into the team. “But I’m ready to play now if required. I feel myself and Grant should be a perfect match. We know each other well from our playing days together. I knew then he would become a good manager as he always had good ideas about the game. “I know what he expects from me and the team, and he will know what I can offer. When I came back to Peterborough the last time I was still recovering from a bad injury and I’d probably hit the gym too hard. “I am confident I can score goals and do all the stuff I used to do well. I have lost four-to-five kilos in muscle recently so I’m leaner than I was and I feel sharp. “It would be great to score my 100th goal for the club so there is unfinished business there, but I want to kick on and do more than that. I want to help the club back into the Championship. Mackail-Smith left Posh for Brighton in the summer of 2011, just after helping Posh to promotion to the Championship. He had scored 99 goals in 212 appearances spread over a five-year spell when he left for the south coast in a £2.5 million move. Mackail-Smith returned to Posh in November 2014, but made just three appearances without scoring a goal. He has started just two Checkatrade Trophy games for Luton this season, scoring one goal in a 4-0 win over Chesterfield.